Announced today at New York Comic Con, Dark Horse is bringing the Whedonverse into it’s tenth season with the help of fan favorite authors, Christos Gage and Victor Gischler. “In Buffy, Season 10 is going to be about bringing friendships back together, while in Angel and Faith, relationships are shattered. Magic is starting to come back into the world, but in some surprising ways, like that vampire we saw standing in the sunlight at the end of Season 9,” says Editor in Chief Scott Allie. “The Buffyverse community has been wonderfully welcoming to Rebekah and me. It's a tremendous honor for Joss and Dark Horse to trust us with their flagship book, and we are going to do all we can to be worthy of that trust. 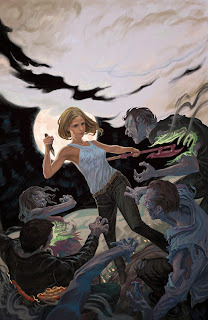 It's a new season, with new rules...but hopefully the same blend of love, action, horror, humor and creativity that's made Buffy and her Scoobies part of all our families. We hope you'll join us for the ride,” states Christos Gage. Angel and Faith is also slated for a 30 issue run, written by Victor Gischler and illustrated by Will Conrad, with covers by Scott Fischer. 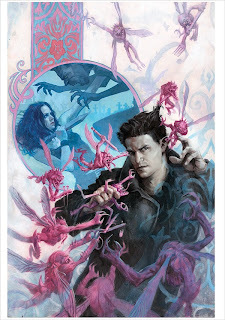 “I'm very happy that our Angel and Faith artist has hopped over to Buffy, allowing our Buffy artist to jump over to Serenity. And to make the game of musical chairs complete, the guy who draw the first two Serenity miniseries is back in the loop, taking over Angel and Faith. These are all artists Joss and the writers and I are comfortable working with, and who are cozy with these characters, so it's nice to shake things up a bit while having a lot of confidence in what these artists can do. And I'm so happy to have Will back,” adds Scott Allie. Buffy the Vampire Slayer Season 10 #1 hits stands March 19th and Angel and Faith Season 10 #1 is on sale April 2nd in comic shops everywhere!